Students walk on North Campus during the snowstorm. Students woke up to blistering snow, cancelled classes and unforgivable winds as plows cleared UB parking lots on Wednesday and Thursday. Across the Buffalo-Niagara region, up to 24 m.p.h. winds and 18 inches of snow whistled in between Tuesday and Thursday night. And you were lucky to feel your face after two minutes if you stepped outside at all. Students faced blizzard conditions, as temperatures on North Campus felt as low as -26 degrees on Wednesday morning, according to the Weather Channel. While snow circled off sidewalks and roofs in dust-devils, UB officials reported motor vehicle accidents and minor electrical issues on campus. Most students stayed indoors, but a slim number of students who braved the cold winds said the weather was unmanageable. There’s been four blizzards in Buffalo since 2014, according to WGRZ. But for some international students, the storm was their first “real” run-in with snow. Nikki Kaur, an international student from the Singapore Institute of Management, grew up in England. She said winters in England are “wet” and ice is “very thin,” whereas Buffalo students layer up and dress in snow boots. “I was happy for five minutes with the weather. I like the winter-wonderland look out of my window in South Lake Village, but the moment you step out, you want to go back in,” said Kaur, a senior psychology and sociology major. Kaur said she experienced frostbite on her hands already and made sure to keep her skin moisturized. She said the blizzard complicates activities, like smoking outside. The blizzard bumped up January’s snowfall total to 63.4 inches by Friday — Buffalo’s fourth-snowiest January on record, according to the National Weather Service. January’s snowfall, however, did not eclipse the brutal January of 1977 (and its respective blizzard) where 68.3 inches of snow fell on the Buffalo area. The Buffalo News also reported three local deaths due to blizzard-related causes, including Lawrence “Larry” Bierl, a well-known homeless man in Williamsville. The harsh winter conditions caused the majority of students to stay indoors but a few who made the journey to academic buildings faced setbacks. On Wednesday evening, students had to squint to spot the Stampede as it made its way through the fog into Ellicott Complex. Thursday was brutal, too, with temperatures reaching a high of 7 degrees across North and South Campus areas, according to Accuweather. UB spokesperson Kate McKenna, in an email Wednesday evening, wrote that UB’s top priority during the severe weather was the safety of students, faculty and staff — on and off campus. “We do not recommend that students come to campus. We also strongly recommend that students who reside on campus stay indoors because of the severe wind chill and low visibility,” McKenna said. UB Facilities received “a few complaints in general” but the department was active and prepared with three winter shift crews working throughout the storm, according to Chris Donacik, UB Facilities’ assistant director of operation. The UB Stampede operated during the storm on its Saturday schedule and the North Campus Shuttle on its weekend schedule. Donacik said buildings’ pipes can freeze during extremely cold temperatures, but pipe breaks occur as temperatures warm and the “thawing process” begins. Pipe breaks have historically affected apartments in Flint Village and South Lake Village specifically, according to Joshua Sticht, UPD Deputy Chief. Donacik said facilities’ employees are monitoring building conditions even as temperatures increase into the weekend. Most activities were cancelled or postponed on Wednesday and Thursday, but some events went on as planned. During the game’s intermission, Alumni Arena experienced a partial power outage, which lasted about 20 minutes but didn’t deter the Bulls from draining practice buckets on their home court. Sticht said the issue was due to a power trip that was an easy fix for UB Facilities. Elsewhere, Campus Dining & Shops kept their dining halls open from 8 a.m.—9 p.m. Wednesday and Thursday. Hubie’s and Au Bon Pain eatery remained open but with reduced menus. The Elli also remained open. With the blizzard impacting students’ schedules, UB extended the spring semester drop/add deadline to 11:59 p.m. on Thursday, Feb. 7, according to a UB alert. UB officials reported and responded to a number of snow-related events and emergencies during the blizzard. Snow got into an electrical transformer at Furnas Hall on Tuesday, according to Sticht. The power outage was a larger issue than the one at Alumni Arena, Sticht said, but UB Facilities addressed the problem and restored power through a back-up transformer. UPD performed services for people who called dispatchers due to weather-related emergencies, such as lack of transportation. Specifically, Sticht said UPD transported people who waited at bus stops for UB shuttles, which ran in reduced capacity due to the weather conditions. Twenty-eight motor vehicle accidents occurred throughout UB between Tuesday and Thursday, according to Sticht. Sticht said only one of those accidents resulted in injuries, which were minor. Spectrum editors witnessed a driver who hitched a sled to the back of their van in the Student Union parking lot. And, while the first week of classes usually brings hundreds of students from the residence halls to the Student Union, The Spectrum only found one student in the SU lobby by mid-day Wednesday. Kevin Meloni, a junior psychology major, was alone and working on his laptop in the SU lobby. Meloni, a wrestler on the UB wrestling team, said he’s faced tough battles before. Ellicott resident Michael Navarro said his Wednesday snow day started with a fire alarm in the negative-degree weather. He was glad his RAs had him wait inside the Ellicott Complex, and not outside during the alarm, but still said the temperatures were unlike anything he was used to while living in New York City. His only time outside on Wednesday, all “two seconds” of it, was spent leaving his dorm for food at Au Bon Pain. He, like many other students this week, was breathing heavily and rubbing his hands together during his seconds-long journey. 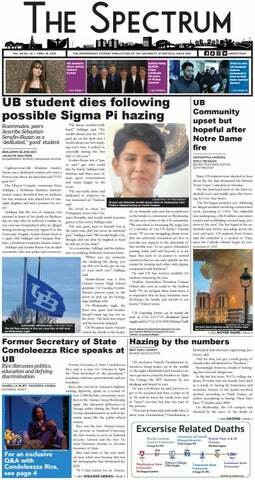 Benjamin Blanchet, Jacklyn Walters and Tanveen Vohra are editors and can be reached at news@ubspectrum.com and can be reached on twitter at @BenjaminUBSpec, @JacklynUBSpec and @TanveenUBSpec. Brenton Blanchet and Nathaniel Mendelson contributed to this story.